A team of Bulgarian archaeologist led by Professor Nikolay Ovcharov has discovered relics of a medieval saint at the fortress of Perperikon in the Rhodoppe Mountains. According to the Sofia News Agency, the remains of human bones were found inside one of two bronze crosses as the archaeologists were excavating two churches. One of the crosses is larger and has an life-like image of the crucified Jesus Christ on its front, and an image of Virgin Mary praying on its back. It is dated back to 10-11th century. The second cross is smaller, with geometrical motives, dated to 5th-7th century AD, and it is inside it that the archaeologists found the remains of human bones. "These are broken and decayed bones, most definitely of a saint. We will never learn which saint they belonged to, there are no inscriptions or signs whatsoever," Professor Ovcharov said. He underscored the fact that Perperikon, the ancient Thracian city, had later become one of the most important centers of Christianity in the entire region. One of the two churches discovered at Perperikon is the oldest in the region, dated back to 4th and 5th centuries, the rules of Emperor Arcadius (395-408 AD) in the Eastern Roman Empire, and Emperor Honorius (395-423 AD) in the Western Roman Empire, after the division of the Roman Empire in 395 AD. This coincides with the mission of Bishop Niketa of Remesiana (lived 335-414 AD) who started to convert the population in the Rhodoppes to Christianity in 393-398 AD. Ovcharov's hypothesis is that the church at Perperikon was the first church of Bishop Niketa in that region. Ovcharov's team has discovered numerous coins of both above-mentioned emperors, which are a proof about the dynamic development of Perperikon at the time, and believes that it was the seat of a bishop from the 4th to the 14th century, right up to the Ottoman conquest. 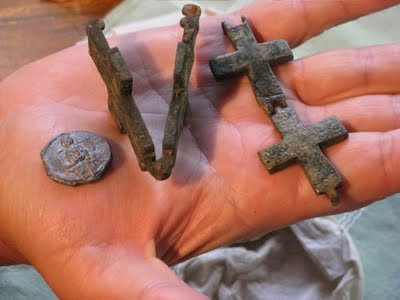 The archaeologists have discovered a number of bronze, gold, and silver crosses, as well as a number of seals. The latest seal they found bears the name of Byzantine dignitary Museliy Bakoriani (or Muselius Pakourianos). The name Bakoriani is connected with the founders of the Bachkovo Monastery, which is located nearby, and is still operating today, and attracting thousands of visitors. The monastery was formally founded in 1083 AD by the brothers Gregory and Abasius Bakoriani. The archaeologists are seeking to discover information about the actual connections between the Bachkovo Monastery and the city of Perperikon in the Middle Ages. The relics of the unknown saint will be donated to the Assumption of Mary Church in the nearby city of Kardzhali where since 2003 pieces of the Holy Cross of Jesus Christ discovered by archaeologists have been preserved.